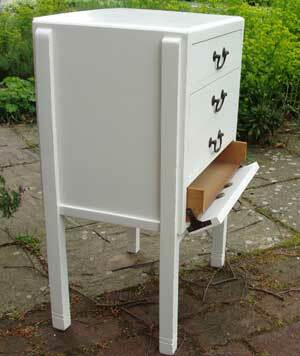 This music manuscript cabinet was an unlikely choice for a shabby chic paint treatment makeover. But it certainly proved a winner. Its previous identity was a dark brown varnish set off with blackened brass handles. Its decoration was minimal, comprising lines near the base of each leg. It did its job of storing sheet music. But decoratively it didn’t do much more. The design brief was to paint with a plain Farrow and Ball All White paint and leave with a clear, neutral wax coating. A sparkling clean finish with some shabby finish. So, entirely in keeping with the Shabby chic colours of 2013. 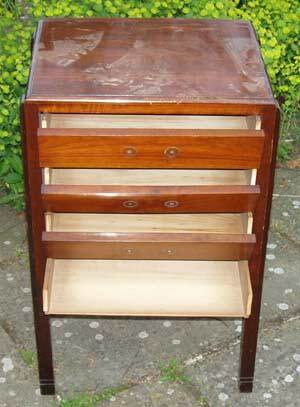 We had to remove the drawer handles and the drawer fronts to give this unit a smooth paint finish. We don’t normally remove drawer fronts, but these drawers featured fronts that tipped forwards revealing their sheet music contents. Very neat construction, but tricky to paint. So off they came. Sanding off the varnish was simple with this piece of furniture. Sometimes it can prove tricky, depending on the varnish applied over the years and its state of repair. The music cabinet still had its original varnish in place. We needed several coats of primer undercoat to mask the original dark wood. With some furniture we have to apply a cover stain paint to hide serious colour leaching. On this occasion that wasn’t needed. We followed up with several coats of Farrow and Ball’s All White Paint before the shabby chic application itself. Finally we gave the cabinet some wax and a buff. The net result is a pleasing piece of shabby chic furniture that’s destined for a bedroom with a new role as a bedside table. So, another good shabby chic restoration. 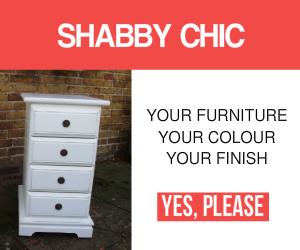 Of course, when you are ready to discuss your next shabby chic furniture project then please don’t hesitate to get in touch. Because we can always help you the range of colour or treatment choices that you have available.